Even though man-buns and shoulder-length hairstyles for men have been very popular in recent years, short haircuts still hold sway for many men. These cuts are both comfortable and attractive, something many men look for when thinking about their hair. Here’s a quick run-down of some of the most popular men’s hair styles. Undercut. In the undercut, the hair on top is kept medium length, while the sides are undercut. It comes in many variations, such as the side-swept undercut with the top hair brushed to one side. You can also shave designs and patterns into your undercut. Fade. Fade haircuts come in many shapes and sizes. In all of them, the lower half of the hair is shaved. Up top, the hair is kept longer, but is trimmed and shaped. The trimmed lower half ranges from the longer classic fade, to the regular fade, to a high fade which resembles a Mohawk. The top can be also be left longer, giving you more room for experimentation. Side part. With this haircut, the hair is deeply parted on one side of the head. The rest of the hair is brushed over top and fixed in place with a product to give a look that is both stylish and classic. Pompadour. In this haircut, the hair on the sides is clipped close or faded, and the hair on top is left long with lots of volume. A pompadour looks great for men with round and square faces because it adds length to these shapes. The textured pompadour uses lightweight pomades to allow you to have more natural texture on top. A full retro pompadour will bring your pomp to new heights. Faux hawk. Like the original Mohawk hair cut, a faux hawk features clipped sides and a strip of hair down the middle. With a faux hawk, some of the longer hair on top is trimmed. This can be gelled into ‘hawk’ position or left to flow free. In the classic Mohawk, the top hair is left longer, while a fade Mohawk has medium-length spiked hair. Taper cut. As the name sounds, a taper cut involves decreasing the length of the hair as you move from top down the sides and back. This style works for many men, although it is best when tamed with product. Fringe cut. This cut brings hair down front, across a man’s forehead and face — also known as bangs. The angular fringe involves short sides and a longer top with a fringe that hangs over the forehead at an angle. The fringe cut may not work for men with oval faces because it puts too much emphasis on the forehead. 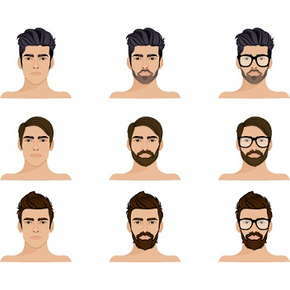 These are just a few of the potential hair styles for men to choose from. A hair professional can help you find a style that fits both your hair type and facial structure. It’s also important to find a haircut that works with your lifestyle. For a style that looks great on you, visit us today for some expert hair advice.